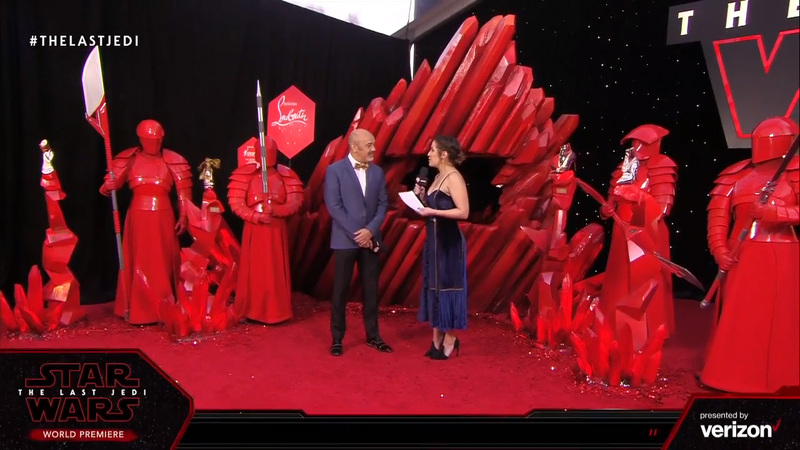 One of the highlights of red carpet premiere of The Last Jedi was the interview with shoe designer Christian Louboutin. The Star Wars Show host Andi Guetierrez talked to Christian Louboutin about Star Wars shoe designs he created, his collaboration with Lucasfilm, and his signature red colour. 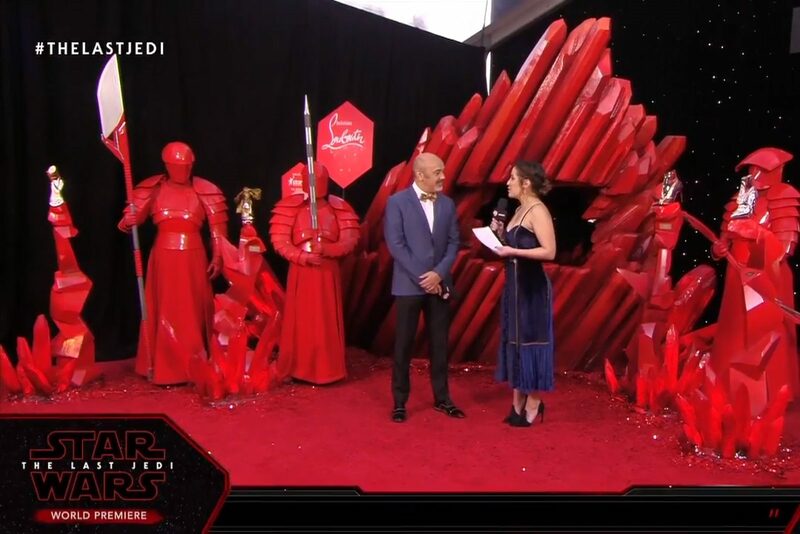 The red carpet featured a fantastic red themed display for the shoes, complete with Praetorian Guards! 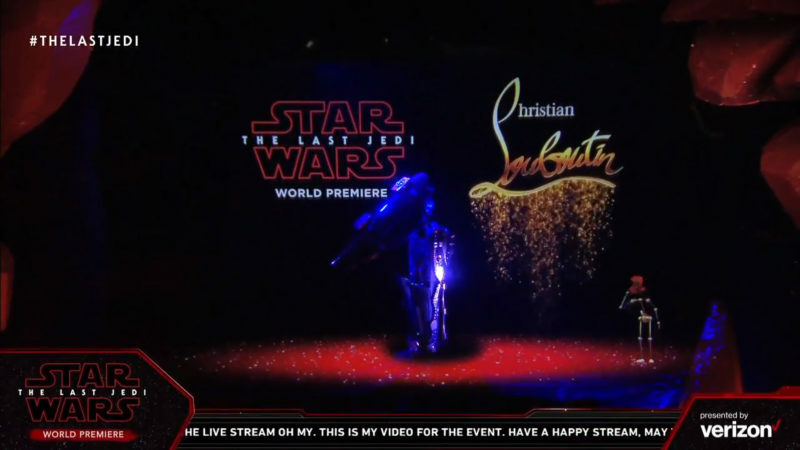 I would have loved to have seen this in person – I have been a long time fan of Christian Louboutin shoes, so it is so exciting to see a fashion designer I love collaborate with Star Wars for a collection. Though sadly the new Star Wars inspired shoes aren’t available for standard release, the 4 pairs created will be auctioned for charity in partnership with Charity Buzz and Force For Change. There is a part of me that is relieved these designs aren’t for wide release, as they would be outside of my wallet’s reach. This way, I can admire them but not feel too sad about not owning them – though of course I am jealous of the lucky fans who win the auctions! 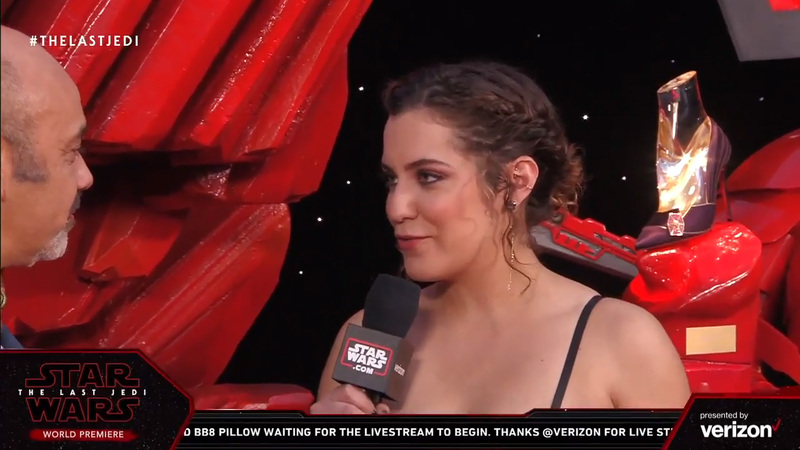 Andi – I’m here on the red carpet with a world renowned shoe designer who has teamed up with Lucasfilm to create something truly special for Star Wars The Last Jedi. Please welcome Christian Louboutin. Thank you so much for joining me. Andi – So Christian, can you tell me a little bit about what it was like collaborating with Doug Chiang and Lucasfilm for these designs? Christian – it was really a fantastic experience for me because, he is doing an amazing job, he’s been there for over 35 years now, and so I was quite anxious to meet him first, so it’s been very very very easy, because we’re coming from the same world, we’re coming from the world of sketching, so everything he starts, it is starting by a sketch and I’m doing the same thing. So once we understood that we had in common a certain vocabulary, it was very very easy and everything is done by his imagination, his thinking, he refers to Rian, he refers to people of the movie and then it goes back and forth so, he did the same thing with me and it was great. Andi – That sounds like a really great collaboration process. Now red is obviously a very important theme in the film and to you, can you tell me a little bit about what that colour means to you? Christian – Well to me it means a lot because I’m, my first job is really designing shoes and all my soles are red, it’s been my trademark, so it’s, it’s definitely sort of my colour, would say, first thing, but if I have to say something about red, is first thing that comes to me is it’s a colour of love, and let’s say for that movie or more in general it’s also the colour of passion and it is a very passionate and very active movie so the red colour is giving a maximum of passion to it. Andi – Now we have four designs here that are absolutely beautiful, can you tell me a little bit about the theme and creation process for them? Christian – Well I’ve been designing, I’ve been asked by the studios to design shoes in reference to the main lead, and to the main actresses in the movie, but according to their character. So one shoe is, each shoe represent one of the character, so of Phasma, of Rey, of Rose and of…, and of Amilyn Holdo. So they’re all different, so there’s just one thread, one red thread I would say, they all have one same element. Every shoe is completely different but they have one element in common. Andi – That Beautiful little TIE Figher on there. Christian – Exactly. My interpretation of the TIE Fighter. Andi – Now behind us is a really special piece, a never before seen shoe that you created. Can you walk us through the story and the design of that piece? Christian – Yes. Um, so when the people from Star Wars came to me, I thought ‘okay great, let me see the movie and I’m to… I’m going to think about it, and they were like ‘well you know it’s a little bit of a secret, we can’t, you can’t really see movie’ which I realised after. So I just was looking at pictures and I was just, so I had some pictures on, I had some story detailing about the movie. One thing which seemed very important was this planet, the new animals on the planet, the new, the new guards too that we have here too, so different thing that I could, I was interpreting and incorporating in what I could think about. And, but this planet is red, but it’s underneath. It’s red but on the top it’s white, it’s icy, so I thought there should a little character, because I was thinking working for ILM, with ILM, is a possibility for me to something which has to do with technology which is not my thing at the very beginning. And as they do it so brilliantly I wanted to really to incorporate something which was a marriage of technology and my work which is very very minimal. So I thought of this little character who is going, who is going on the planet from the red planet, scratching the planet to get some red minerals, and out of that, creating a shoe, then there is a storm in the planet. So the shoe gets open because it’s definitely inspired by Star Wars, gets open. The character, the little character which is a nomad gets into the vessel, shoe, which is a shoe vessel, closes and [woosh!] leaves the planet. Christian – So it’s a little animated hologram. 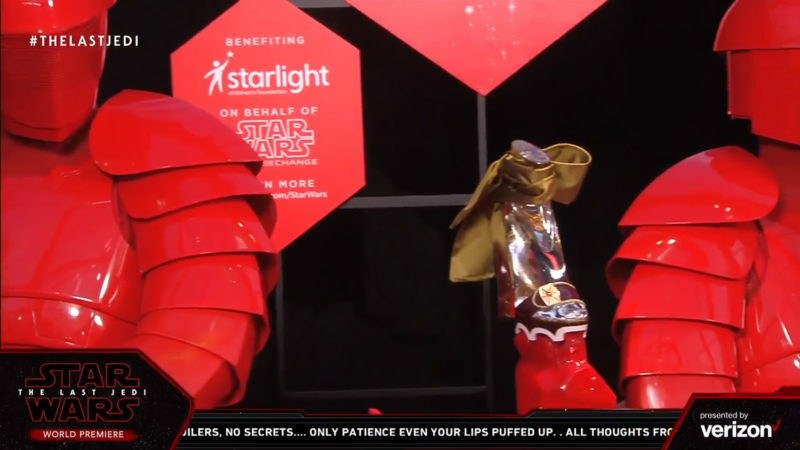 Andi – It’s absolutely phenomenal, and such a cool way to show off the design, and if you at home want to bid on one of these four wearable designs, head to charitybuzz.com/starwars and the proceeds will benefit the Starlight Children’s Foundation through Force For Change. Thank you so much. The red carpet display revealed an animated hologram of the little nomad character Christian Louboutin described in his interview, with a spaceship in the shape of a high heeled shoe. Created in collaboration with ILM, the ‘shoe vessel’ opens up, and includes little TIE Fighter wings flying like butterflies. At time of writing, the Rey, Amilyn Holdo and Captain Phasma styles have a top bid of US$5,250, while the Rose Tico style has a top bid of US$6,250. Each auction includes 2 pairs of the design – the pair seen on display which are signed by Christian Louboutin and the actress for each character (eg, Daisy Ridley has signed the Rey style), plus an additional pair in the winning bidder’s chosen shoe size. 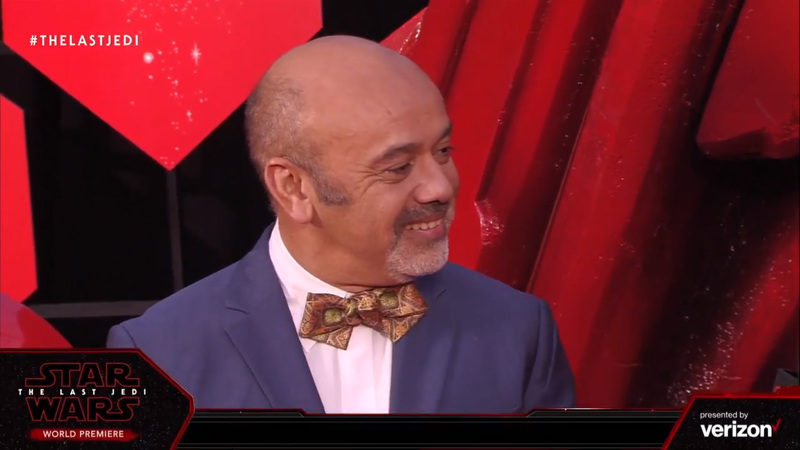 CHRISTIAN LOUBOUTIN CELEBRATES THE RELEASE OF STAR WARS: THE LAST JEDI TO BENEFIT CHARITY! Christian Louboutin has created four exclusive custom shoes styles and one custom showpiece epitomising the spirit of the film’s heroines — Rey (Daisy Ridley), Vice Admiral Amilyn Holdo (Laura Dern), Captain Phasma (Gwendoline Christie) & Rose Tico (Kelly Marie Tran). The commemorative styles — each signed by the designer, as well as the actress that portrays each character the style was created for, will be auctioned from December 7-December 20, with proceeds benefitting Starlight Children’s Foundation on behalf of Star Wars: Force for Change. The showpiece, unveiled at the premiere on December 9th will be added to the auction after it’s much-anticipated reveal. Photos sourced from and belong to the official Star Wars Youtube channel.